Jedinovice wrote: To see Miku in action as a person see here, seriously. Worth it. You'll see. Nope, sorry, that does not work for me at all. My previous comments stand. It is my belief that computing attracts a very particular personality type as well - the INTP. I know because I was surrounded by them at Uni and spent 15 years working alongside them in IT roles! The INTP type is very analytical, through and tends to value high intelligence over emotion or sentimentality. They devour information and can often speak to tech as if it were their first language. Er, so much so,sometimes, that I have had to act as the translator for the rest of the world a few times turning tech in English! INTP's, er, tend not to be romantic. (Oddly enough, I have found quite an attraction to rock music among this type.) In fact, the INTP gets really, er, irritated with those they regard as stupid or irrational. Anime characters tend to be favoured by romantics. I'm an off the scale romantic! Although I have worked in IT in my time - in very technical roles in fact, my personality has always been at odds with the usual techies that surrounded me! My point being... I was not really being that serious about a 'tan' - though I was about Miku having a personality - because, I would not expect anime characters to be favored amongst the Linux community! Not a hope! In fact, I would expect Rock icon/characters to be better favored! If one is seeking to have a mascot for the EXISTING Linux fraternity sentimentality is best avoided. That may be why Tux worked... That, and the fact a fellow INTP came up with the idea - Torvalds himself! And Tux was never intended to be cute! If Mint is going to have a mascot... it would have to be something edgy I would think, not sentimental. More rock than anime I would suggest as a starter. But even then there would be clash between being 'edgy' and Mint as a friendly OS. But I doubt, in reality, a mascot character for Mint is going to fly. I don't think most Mint users would ever actually get into a mascot character. If I were SERIOUS about a Mint mascot; I would just take Tux and give him a green hairdo myself. As Linux Torvalds put when the 386 code standard was eventually dropped; "I'm not sentimental. Drop it." I don't see Torvalds as an anime fan. Just go green haired Tux. Mint Linux 18.0 64 bit KDE edition. Video editing (AMV's mainly) on a dual core n2840 atom! Oh, the Mint logo needs improvement, that we can agree on. Jedinovice wrote: I doubt, in reality, a mascot character for Mint is going to fly. I don't think most Mint users would ever actually get into a mascot character. If I were SERIOUS about a Mint mascot; I would just take Tux and give him a green hairdo myself. Tux is a penguin. Still not going to fly. Tux is an abomination, too. No cuddly toys please. Mascots just feel like such an unnecessary 'bolt on.' We don't want to attract any more bronies to Linux. I usually don't use such direct wording, but that's ridiculous. Everyone uses computer nowadays. If you're talking about making Mint more attractive, you'd be wanting people from all walks of life. Not just the INTP type. INTP don't need silly mascots to be attracted. Remember this annoying guy from Microsoft? MintBean wrote: Tux is an abomination, too. No cuddly toys please. Mascots just feel like such an unnecessary 'bolt on.' We don't want to attract any more bronies to Linux. OK, let me clarify a bit. For the record, while it has taken a while to get people into Linux, oddly enough, as I count the 'converts' every single one has been an INFP, excluding the local orphans. Two of them are serious anime fans. Of those two one is going into electronic engineering so of course life is not so simple. I concur that lots of different type of people use technology and Linux. That is a given. And they tend to be the ones who frequent (and moderate!) technical boards like this one! On a Linux forum I doubt you are going to find much support for mascot or cute!! As I believe I have just demonstrated! A mascot might get more traction among other personality types including the hopelessly starry eyes INFPs (I suffer the affliction. ) But one is likely to get better feedback on a mascot character on other forums which are more likely to attract the other types. I think you will find that technical forums are rather INTP dominated! Discussion of a mascot caracter especially a TAN or anime char might be best done, oddly enough, on an anime forum. I belong to an AMV forum, though I have had very little time for it this year with the demands of setting up my business. Man, am I looking forward to next year when all the initial set up costs and work is complete! Heck, my Hatsune Miku tribute video is just frozen in development! But I would also argue that I do not see how a mascot actually work because I think mascots actually work with technology. The only exception I can point to, and it's more because the mascot is the product is Hatsune Miku! Then I demo more from there. As it is, I cannot think of a mascot character outside of Tux, which is more of a Logo, that I can associate with any technology. I grant your note regarding clippie but clippie was not a mascot character. He/it was more like Miku - a feature. And Clippie was loathed and despised! Frankly, the real issue with getting greater traction with Linux I find is the ENTRENCHED belief that Linux is a techie's only OS which is really hard to use with no usable software. Then there is Windows inertia with people absolutely unwilling to move from Windows even when learning Windows 10 is harder move from 7 than (say) Mint Linux KDE. mascot is not going to the ignorant masses because they are, well, ignorant. I mean that literally. Joe Publis still has no idea what Linus, especially a distro like Mint, is like! They are still stuck with a vision of Linux circa 1999! 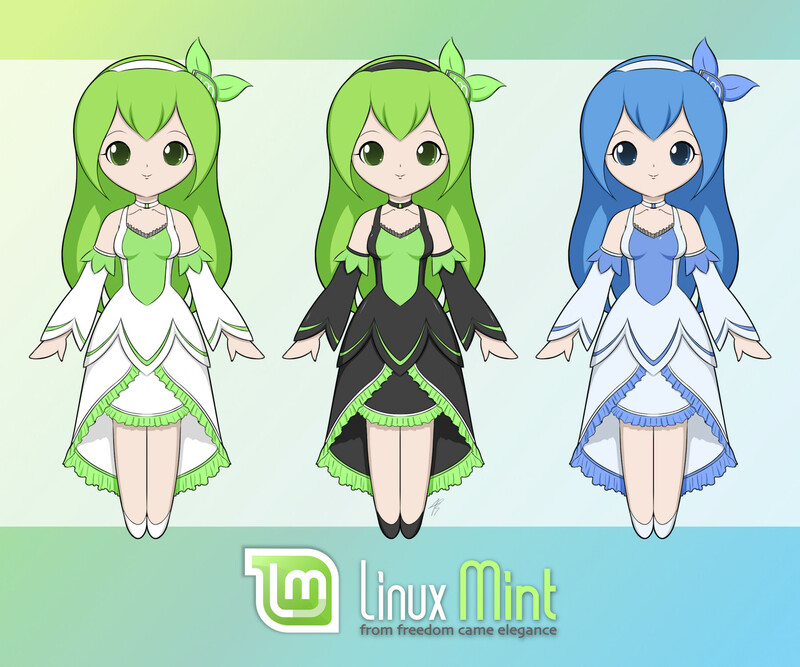 So... if a mascot character is to really be discussed for Mint Linux, I suspect the idea would actually get more traction on other forums related to art and design rather than here. I fear too many techies who would (and have) vomited over the idea! But I must admit that while I personally like the idea of a green haired Gumi like (joke notwithstanding)character representing Mint... I don't think a mascot is going to make any difference to selling Mint to be honest because... I can't think of a single technical product at the moment sold via a mascot. Not even Apple has gone there. I think more demo videos of Mint doing stuff is actually a better bet. At least they can be linked to when the Mac user insists that Linux is an OS for techies only, is CLI only, you have to compile all your code from source, yadda, yadda, yadda... Yes, I have had recent experience! MintBean wrote: Cast your votes please. Done already. I voted for the Care bears! Jedinovice wrote: Done already. I voted for the Care bears! Well i found something on devianart. I think something like that will fit friendliness and elegance of linux. I don't know which of your weird letter codes I would be. I like cute young animals, and cats. I'm romantic. I like comics. And I strongly dislike the way women/girls are generally depicted in manga. Even that 'elegant' version is a weird mixture of doll-like features, baby-like facial proportions, and breasts that indicate a fully grown woman. It's very offputting to me. IUseLinucCusIsFree wrote: Well i found something on devianart. Linux Mint could replace Franklin Mint. You could have a Mint Santa or a 1969 Dodge Charger Daytona Custom in Mint green. Well its not stupid idea. ANd i know where linux mint can find someone to make a good mascot. Actually guy named "Tyson Tan", creator of Konqi and KiKi. He said on twitter he will draw mascot for any free software project, linux mint team can ask him to make design mascot for the best Distro aka linux mint. Always it will improve merchandise and gives more posibilities for promotion. So everyone does not like cute or senseable. How about a Catweasle Pic? I reckon Moem's or All41's avatars could be a mascot, but, seriously? Who cares? We're here for an operating system, not a bl**dy football game!